Nearly twenty years ago, President Jimmy Carter delivered the LeRoy H. Pfund Lecture on February 24, 1992. 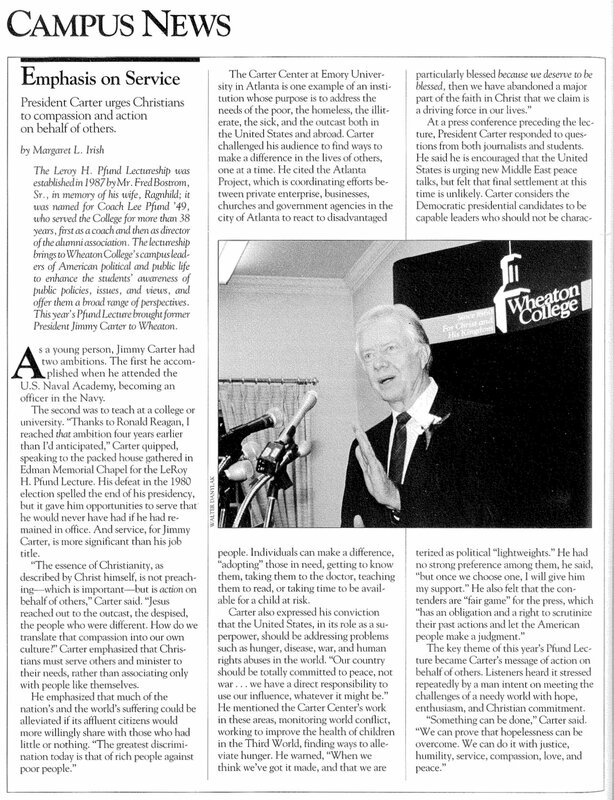 The following article “President Carter urges Christians to compassion and action on behalf of others” by Margaret Irish documented the event and was featured in the April/May 1992 issue of the Wheaton Alumni magazine. As a young person, Jimmy Carter had two ambitions. The first he accomplished when he attended the U.S. Naval Academy, becoming an officer in the Navy. The second was to teach at a college or university. “Thanks to Ronald Reagan, I reached that ambition four years earlier than I’d anticipated,” Carter quipped, speaking to the packed house gathered in Edman Memorial Chapel for the LeRoy H. Pfund Lecture. His defeat in the 1980 election spelled the end of his presidency, but it gave him opportunities to serve that he would never have had if he had remained in office. And service, for Jimmy Carter, is more significant than his job title. “The essence of Christianity, as described by Christ himself, is not preaching which is important hut is action on behalf of others,” Carter said. “Jesus reached out to the outcast, the despised, the people who were different. How do we translate that compassion into our own culture?” Carter emphasized that Christians must serve others and minister to their needs, rather than associating only with people like themselves. The Carter Center at Emory University in Atlanta is one example of an institution whose purpose is to address the needs of the poor, the homeless, the illiterate, the sick, and the outcast both in the United States and abroad. Carter challenged his audience to find ways to make a difference in the lives of others, one at a time. He cited the Atlanta Project, which is coordinating efforts between private enterprise, businesses, churches and government agencies in the city of Atlanta to react to disadvantaged people. Individuals can make a difference, “adopting” those in need, getting to know them, taking them to the doctor, teaching them to read, or taking time to be available for a child at risk. The key theme of this year’s Pfund Lecture became Carter’s message of action on behalf of others. Listeners heard it stressed repeatedly by a man intent on meeting the challenges of a needy world with hope, enthusiasm, and Christian commitment. The Leroy H. Pfund Lectureship was established in 1987 by Mr. Fred Bostrom, Sr., in memory of his wife, Ragnhild; it was named for Coach Lee Pfund ’49, who served the College for more than 38 years, first as a coach and then as director of the alumni association. The lectureship brings to Wheaton College’s campus leaders of American political and public life to enhance the students’ awareness of public Policies, issues, and views, and offer them a broad range of perspectives. The 1992 Pfund Lecture brought former President Jimmy Carter to Wheaton. The Wesley G. Pippert Papers in the Wheaton College Special Collections, Buswell Library also contain a wealth of information about the former president. Wes Pippert came to Washington, D.C. in 1976 in order to cover Jimmy Carter’s presidential campaign as the principal UPI reporter. 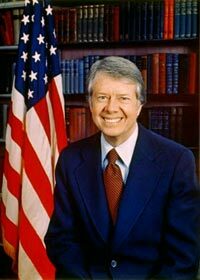 Pippert followed Carter to the White House and was assigned there from 1977 to 1981. He also wrote “The Spiritual Journey of Jimmy Carter: In His Own Words” (1978).